Attendees were greeted with a handwritten note, “Hello Congress! Neither you nor the field will ever be the same again after this one.” And neither they nor the rest of the Scientology world ever were. 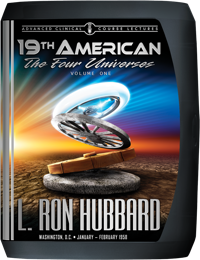 Capping a year of breakthroughs, with processes to reach every case, and training drills that revolutionized auditing, L. Ron Hubbard was about to present the means for a new civilization—a world based on you. It all stemmed from the discovery that, “The aberrated Third Dynamic is the summed irresponsibilities of the First Dynamic. An insane group is one formed by the weak to protect them against the strong. A sane group is an expression of communication by those who could each one stand alone.” And so came Mr. Hubbard’s watershed technology on both the importance of groups and the means to create real Third Dynamics. Whereupon he provided program after program, with the step-by-step actions expressly aimed at galvanizing others around a survival cause. As for that world based on you—here is the dramatic discovery of the true nature of mental image pictures—a breakthrough of such importance he said it should be written on a piece of golden paper. After all, it opened the gates to discovering the ability you’ve always had for billions of years. Here then is the Congress where L. Ron Hubbard moved Scientology, as a whole, three feet behind society’s head. If you want to know your role in a new atomic age, be there! And while nobody really doubted the truth of that announcement in the winter of 1957, hardly anyone could have predicted what history has since proven. 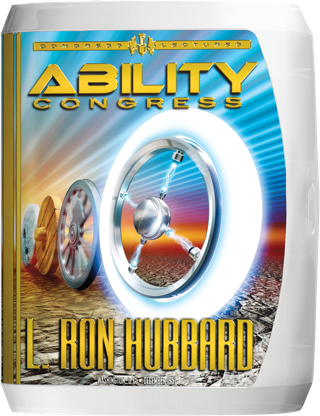 Because for all Scientology stands for today as a powerful force for planetary survival, it all began at the Ability Congress. And as timeless as those breakthroughs were, to appreciate their full scope one must consider the events of the day and that phrase, “your role in a new atomic age.” The nations of Earth had entered a new age of technological advance. Case in point: on October 4, 1957, the Soviet Union had launched Sputnik, the first man-made satellite to successfully orbit the Earth. “Space Opera has again come to a planet on which we live. Always before, it meant destruction. And while only Scientologists could have appreciated the matter in terms of the epic drama of the whole track, the underlying concern of “destruction” was missed by no one. It was, after all, the midst of the Cold War—a war of ideology that said on the one hand “the individual is nothing” (communism) and the other proclaiming nothing greater than “individual freedom” (democracy). All of which explains why that first communist satellite rattled an entire nation, America, escalating world tensions even more. Yet, directly in response to destructive planetary forces, a far greater technological advance had been occurring on the Scientology front. Mr. Hubbard’s radiation research had resulted in new processes (CCH) to crack any case, which in turn had resulted in new training drills (TRs) that revolutionized auditing. Combine it all and that’s what Mr. Hubbard brought to this Congress. A breakthrough concerning mental image pictures, so important he said it should be written on golden paper. Which, in turn, opened the door to Clear Procedure. And all of it encompassed by that word, Ability, and the means to Third Dynamic Survival. From the watchwords of purpose and responsibility, to program after program expressly aimed at galvanizing others around a cause, and from the legendary announcement of the anatomy of Control, Start, Change and Stop, to the very definition of Operating Thetan—it’s all contained here. And as for that Sputnik? When he opened the Ability Congress on 29 December before a record turnout at the famed Shoreham Hotel, he did so by launching his own “Ffftnik” which, sputtering to the top of the stage, exploded on cue with a shower of ping-pong balls. The amusement was warranted. After all, that was the view from where L. Ron Hubbard had now moved Scientology: Three feet back of society’s head.